On Saturday 23rd March 2019 Resonance FM’s Hello GoodBye Show focused attention on the London based independent record label / promoter Upset The Rhythm with label manager Chris Tipton joining us in the studio to discuss all things UTR related from over the past 15 years. Also, featuring UTR label roster mates Hygiene & Robert Sotelo. Live sessions on Saturday 23rd March 2019: today an Upset The Rhythm special with label manager / promoter extraordinaire Chris Tipton discussing the roots and future plans for UTR. Expect to hear exclusive rarities plus live music from Hygiene + Robert Sotelo. Live sessions on Saturday 16th March 2019 ft. self-destructive, stumbling pop brilliance from Australian indie ensemble The Shifters, plus historically inspired, digitally driven conceptual sound-artist and composer Olivia Louvel. On Saturday 9th March 2019 Resonance FM’s Hello GoodBye Show featured live music from Gwenifer Raymond, SILKess Demon & Late Girl. The Shifters – Medieval Kicks! Live sessions on Saturday 9th March 2019 ft. plucking primitivism with Welsh born guitar / banjo virtuoso Gwenifer Raymond, idiosyncratic, femme-focused folk tales of murder and mirth with SILKess Demon plus lush, electroacoustic experimental samples and beats from Late Girl. 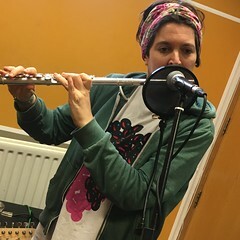 Bity Booker and Nun Habit performed live in session on Resonance FM’s Hello GoodBye Show on Saturday 2nd March 2019.